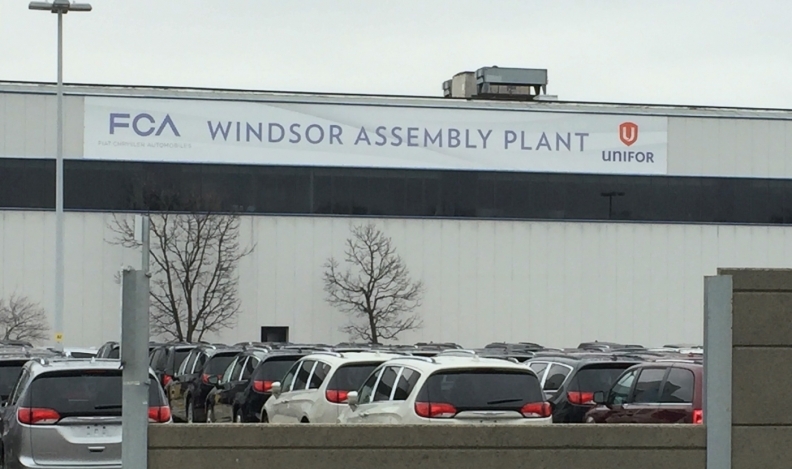 About 5,000 hourly employees work at the Windsor Assembly Plant. Fiat Chrysler Canada is eliminating about 300 jobs from its FCA Transport division in Windsor, Ont., the automaker said in a statement Mar. 24. FCA Transport handles parts transportation at the Windsor Assembly Plant, where the Pacifica and Grand Caravan minivans are built. Spokeswoman Lou Ann Gosselin said the work of 288 hourly employees and seven salaried staff members will now be outsourced. Retirement packages will be offered to all eligible employees at the Windsor Assembly Plant, including FCA Transport. Those employees who elect not to take the package or are not eligible to retire will be offered positions at the Windsor Assembly Plant. FCA did not say why it chose to eliminate the transport jobs. Unifor Local 444 President Dino Chiodo said he wishes the company would have discussed the future of the transport jobs in more detail during the 2016 contract negotiations because perhaps the jobs could have been saved at that time. Chiodo said about 125 hourly employees at Windsor Assembly Plant have retired since the new contract was signed in the fall of 2016. Winding down the transport division will take about six months, he said. Chiodo said there aren’t any non-unionized carriers that service the plant and he said the union won’t accept any in the future.